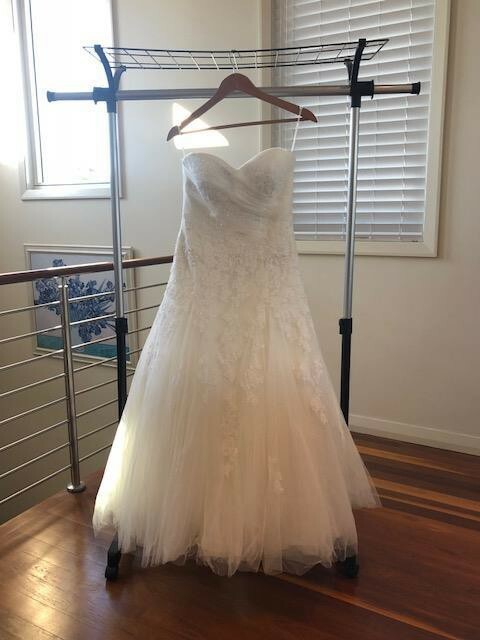 Pre-loved wedding dress. Worn once and is in good condition. Style - Dagen Size - 12 to 14 Colour - Ivy Material - Tulle and lace. Clear Swarovski crystals scattered on dress. Pick up in Sydney. If postage is required, postage costs will be added to the purchase price. 'The Dagen model by Pronovias 2013 is an outstandingly elegant choice for this special day. This spectacular A-line dress has a sweetheart neckline and flowing skirt with godets. Both bodice and skirt are made of tulle and are decorated with gorgeous lace. A light tulle skirt flows out from beneath the bodice giving the entire dress movement.